ProPoster is software for big banner printing, sign printing, poster printing, mural printing, wall photo printing. ProPoster does not require special plotters, it simply prints on standard printers. Any picture, digital photo, Microsoft Word document, Excel spreadsheet can be used as a source for the multipage poster. Also, it is possible to print a poster from a scanner. You can use some powerful graphic program for poster printing, if you have special knowledge and skills. But ProPoster is convenient, simple and intuitive poster software that will free you from unnecessary work. 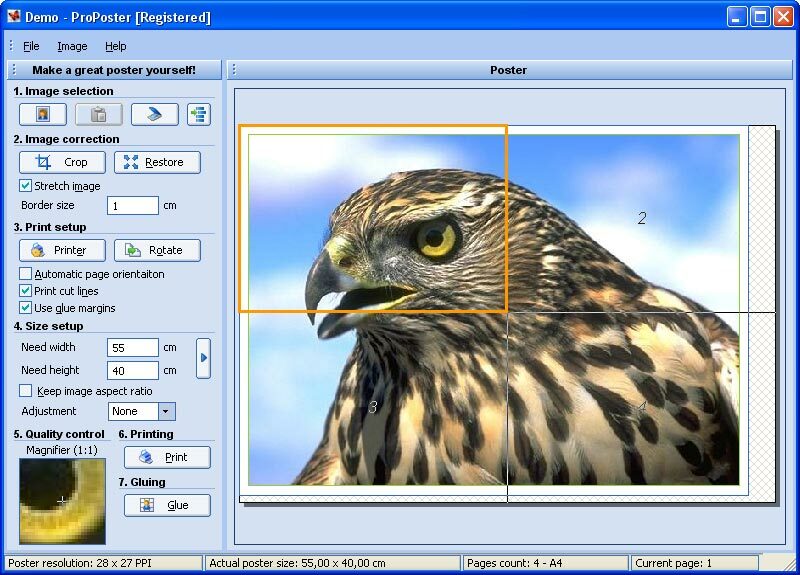 Simply select an image and the software will automatically divide it into the necessary number of pages. To create a poster, you will also need glue, scissors and a bit of skill. Make a great poster yourself! It should not necessarily be your favorite picture or digital photo, advertising banner or any tables and graphics. Just use your imagination. Let it be something unique, maybe even the result of your creativity. Show your own poster to your friends, they will be amazed for sure.